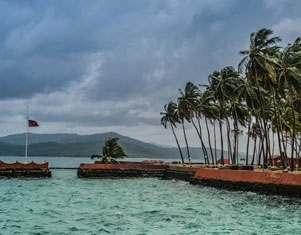 After breakfast, start off for a, Visit Ross Island, the former residential and administrative island of the British during their rule of South East Asia, was nick named the Paris of the East. Later visit to Fisheries museum and Anthropological Museum. Overnight stay at respective Hotel at Port Blair. After picking up your pack breakfast get transfer to Phoenix Bay Harbor to catch a ferry to Havelock. The Island (often just called Havelock) is one of the most beautiful and largest islands of Ritchie's Archipelago and is a placid heaven like no other. It hosts two of the world’s most renowned beach; Radhanagar Beach. The Island also has the biggest concentration of breath-taking diving and snorkeling sites, thus acting as a paradise to marine world explorers. On arrival proceed to selected hotel. Stay here overnight amongst sandy beach and lush green forest in a comfortable beach resort. Trip to Elephant Beach3: Embark on the most memorable snorkeling trip, just 40 min by Boat this beach offers snorkelers calm blue shallow waters and is the perfect spot for beginner snorkelers.. Note: Inclusive of snorkeling equipment and car pick up and drop to jetty.